Sedona is known for its beautiful scenery and spectacular hiking, but a lesser known sport is its epic mountain biking. When Abby and Parker were considering locations for their intimate wedding, these avid mountain bikers wanted to include their favorite activity. 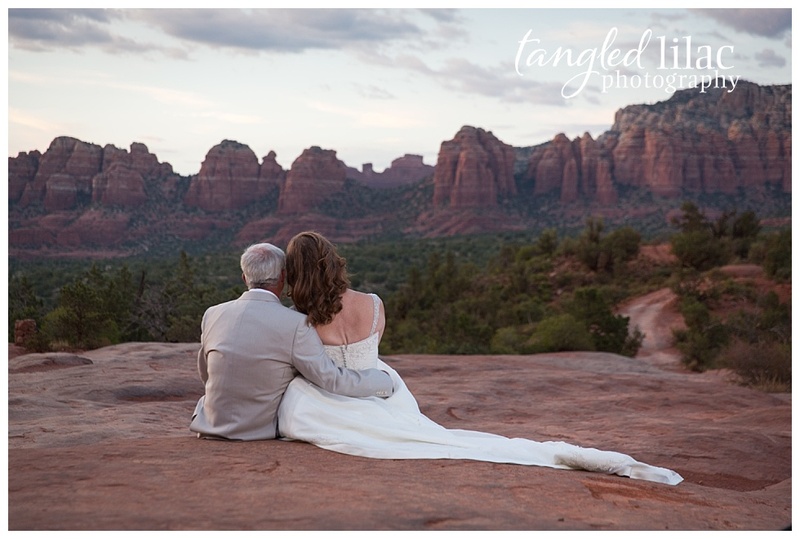 Why Couples Choose Sedona as a Wedding Destination? 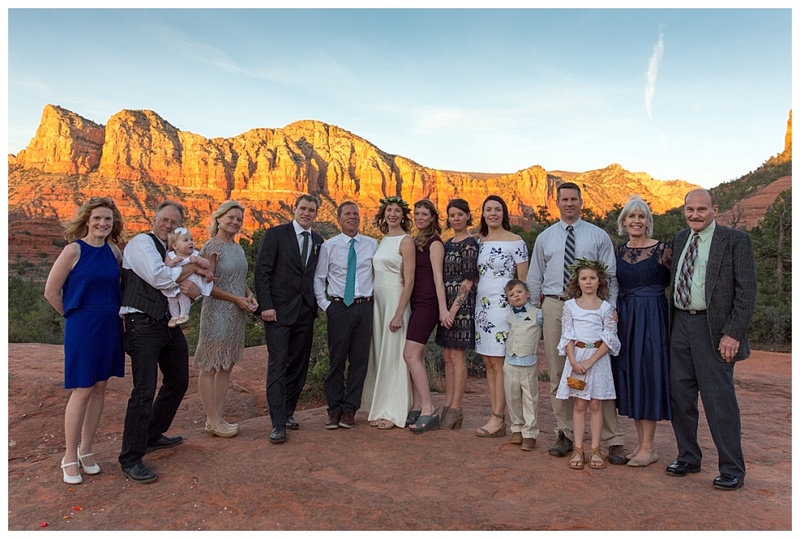 While Abby and Parker chose Sedona because it would allow them to partake in their favorite past-time, there are other reasons why couples choose Sedona to tie the knot. Surrounded by the beauty of the red rocks, Sedona has vortexes that are swirling with a subtle energy from the earth. People have been traveling to Sedona specifically to absorb the energy of the vortexes for centuries. If mystical energy sounds appealing, you can participate in a wedding week retreat or just a day tour to spiritually prepare you for your next chapter. 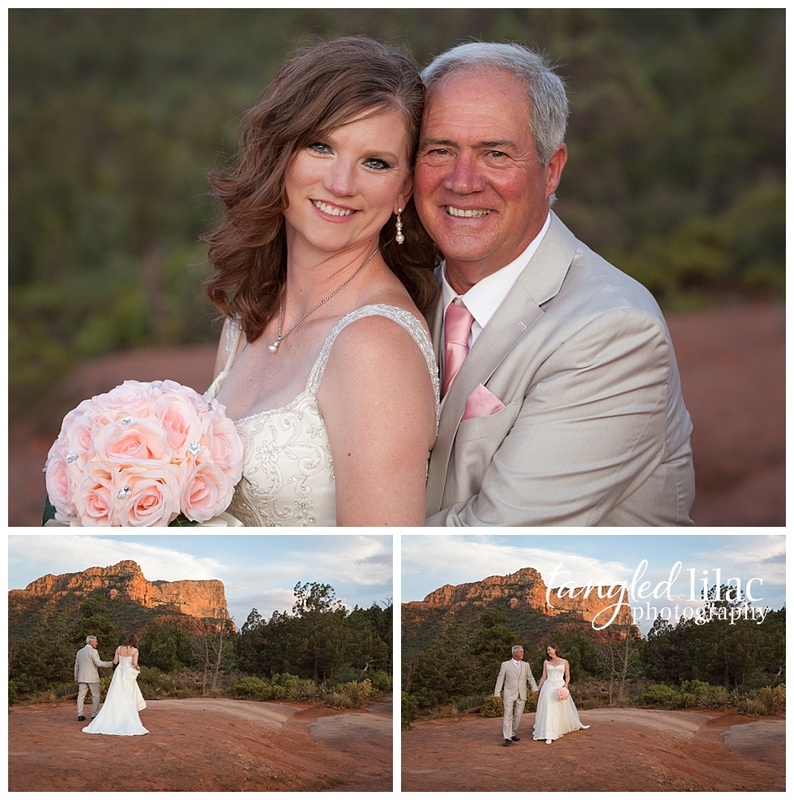 Sedona is the perfect destination for a beautiful and elegant wedding without all the fuss. The pace of life in Sedona is a little slower than most places. Sedona, with all her beauty and magic, is a great reminder to couples of what’s really important at this time – each other. With hundreds of trails for hiking and mountain biking and a creek for fishing, if you love the outdoors, you will love Sedona. Trails vary in difficulty from easy to challenging and provide a variety of views of the surrounding landscape. Some couples even choose to hike to their favorite spot to exchange their vows. There is no denying that the picturesque backdrops and the dramatic scenery attract visitors of all kinds. You don’t have to be an outdoor enthusiast to appreciate what Sedona has to offer. The funny thing, though, when couples are exchanging their vows the scenery doesn’t matter. 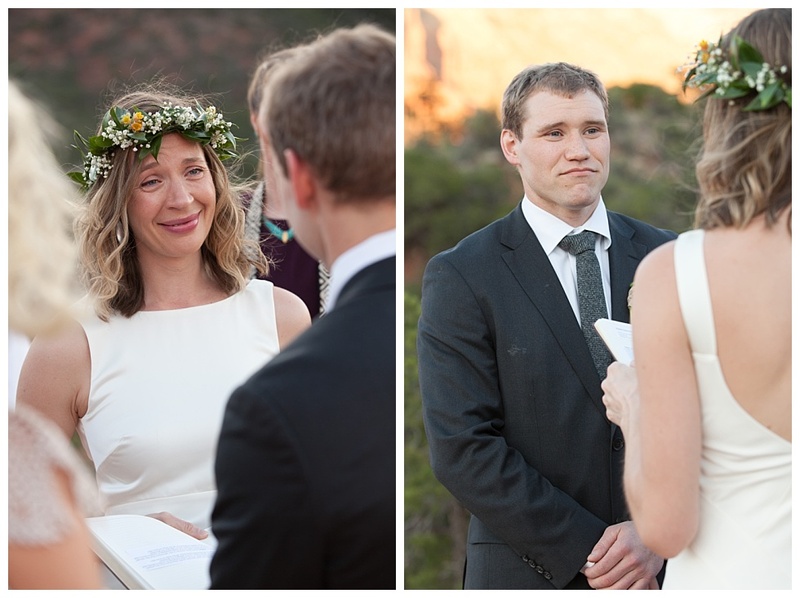 Just look at how Abby and Parker get lost in each other during their vows. 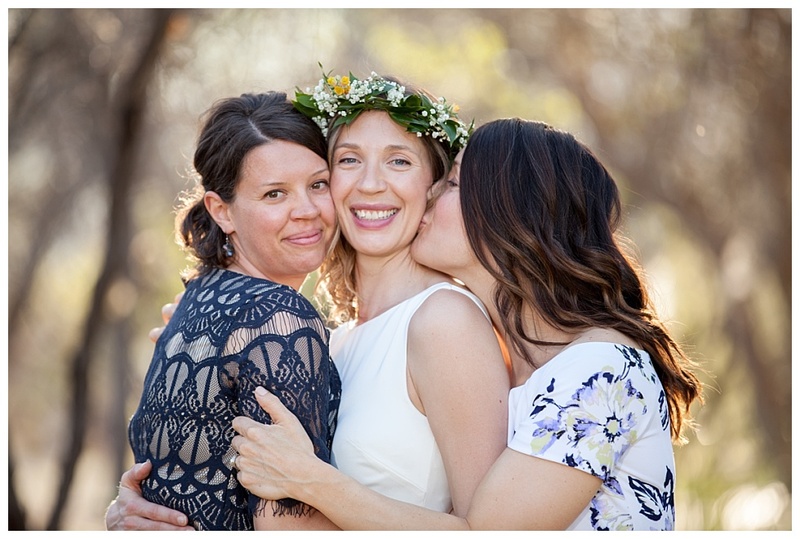 I simply adore small, intimate weddings because I always leave feeling part of the family. There is something to be said for sharing an intimate moment with those that matter the most. 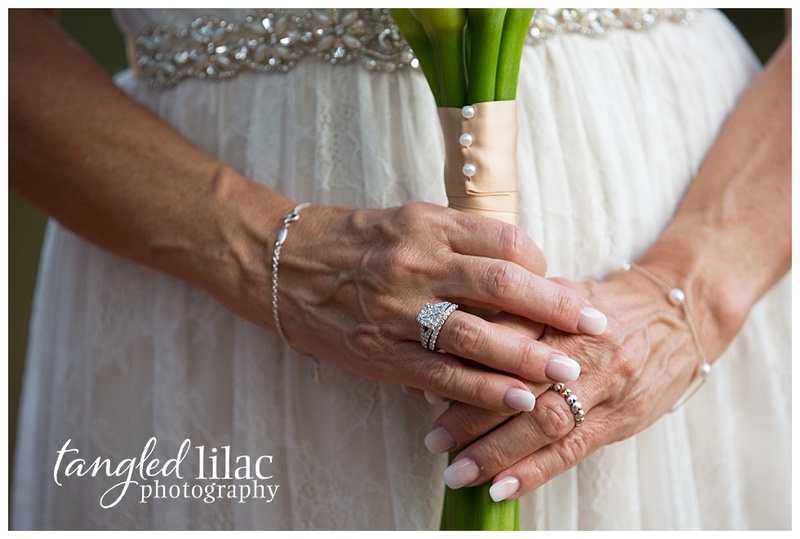 The emotion, love, and support for the couple shine through to the images that I capture. Look at the images of the family and friends that traveled with Abby and Parker to celebrate with them. The love is pure and beautiful. I can still feel the love of the group as I look back on these photos. 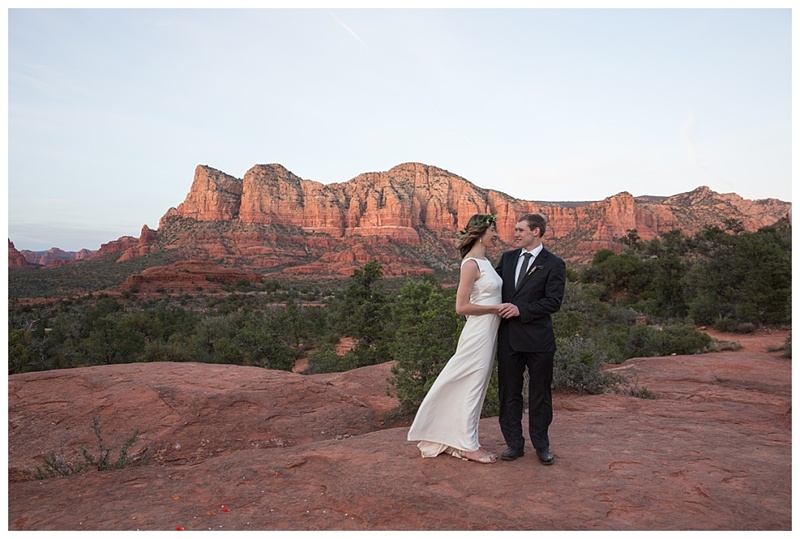 It is easy to say couples choose Sedona because of its beauty. There are no words that truly do Sedona justice. And truthfully, the images don’t do it justice either. As breathtaking as Sedona looks in the images you see, it is even more glorious when you experience it in person. 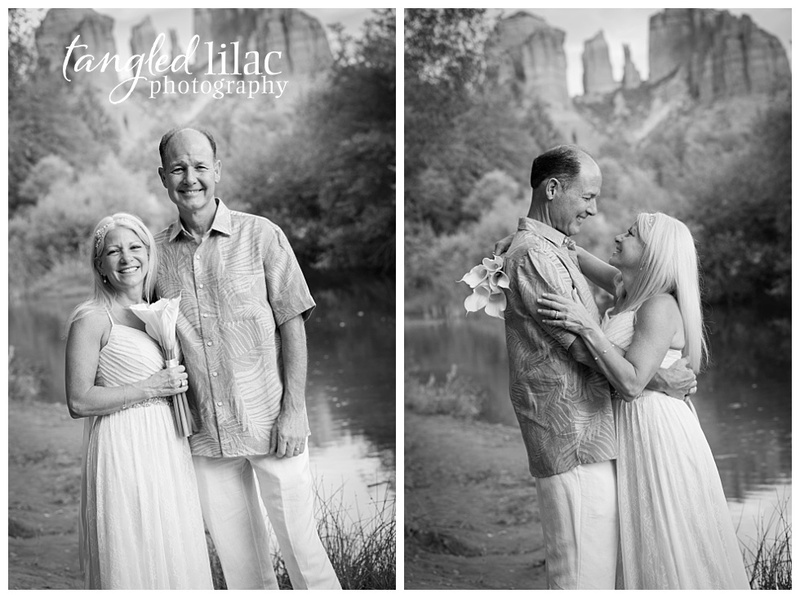 There is something about Sedona that is timeless, just like a marriage should be. Maybe there is something to those magical, mystical vortexes after all. Abby and Parker, may the magic of the vortexes bring you many years of happiness. Thank you for choosing me to be a part of your special day. After a few weeks of posts highlighting a personal passion, pet photography and my new offering, Reflections Photo Booth, it’s time to get back to showcasing the beautiful area in which I live. Horseshoe Bend is one of the most photographed landmarks in desert Southwest surrounding the Grand Canyon. I get excited every time I’m scheduled to head out that way. I knew I was going to adore these two when they drove up in a canary yellow 2017 Camero. There’s just something about a muscle car that drives all the girls crazy, don’t you think? Ivana was the sweetest ever and the perfect compliment to Kyle. She looked perfect in her long lace gown with a beauty that reminded me of a young Demi Moore. Kyle works as a police officer in a small community twenty hours north of Toronto and Ivana lives in Toronto proper. 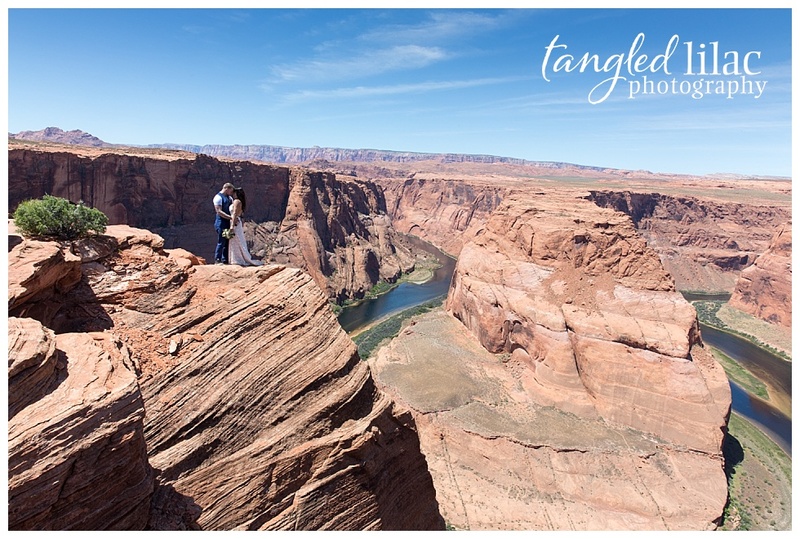 Because our region is just so different from Northern Canada, these two wanted to get married in Las Vegas but do their post-wedding photos at Horseshoe Bend. 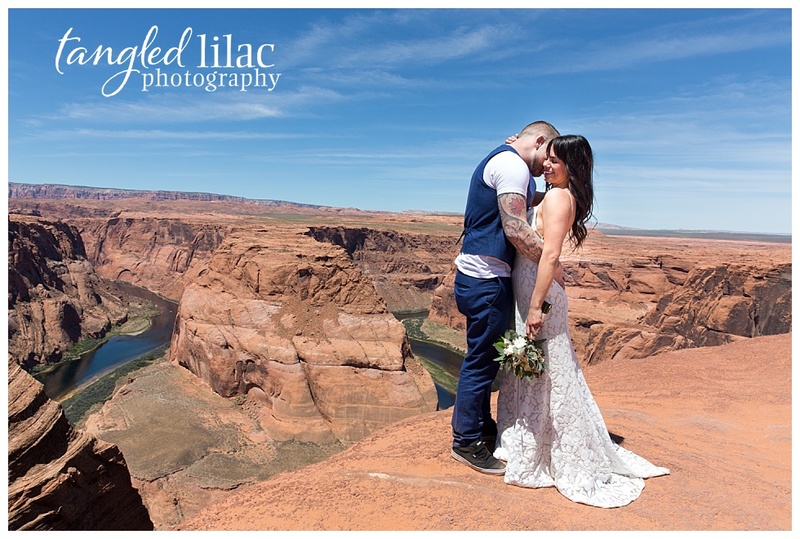 For your reference, you can choose to have your elopement ceremony at Horseshoe Bend, or just head to the area for your photos like Kyle and Ivana did. Many people assume Horseshoe Bend is part of the Grand Canyon, but it actually resides within the Glen Canyon National Recreation Area. It overlooks one of the most spectacular views on the Colorado River, 4 miles south of the Glen Canyon Dam, and 7 miles north of mile zero of the Grand Canyon. It has all the characteristics of the Grand Canyon: The river, the canyon, and the beauty. 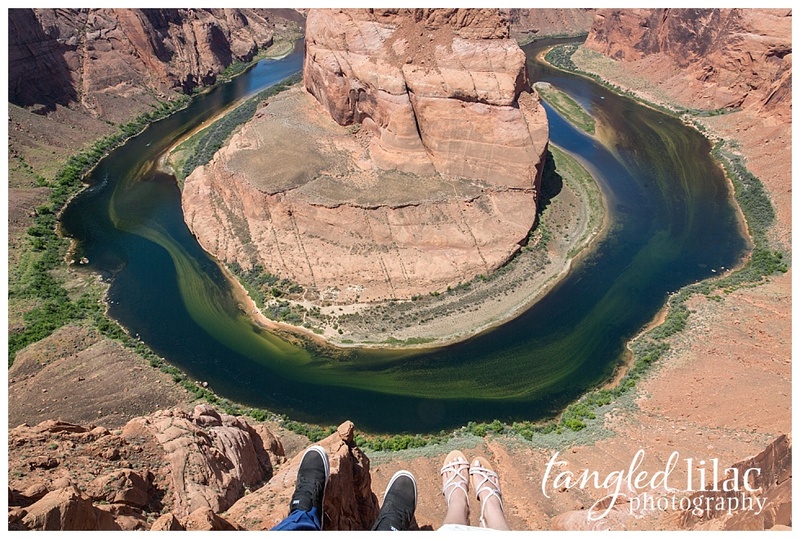 Horseshoe Bend is close to Page, Arizona with scenic Lake Powell and Antelope Canyon nearby. The trailhead to Horseshoe Bend is a 3/4 mile hike. A bit of climbing may be required for some of the stunning backdrops Horseshoe Bend has to offer. There are parts that can be a little steep and there is some sand. So be prepared with hiking shoes or other comfortable footwear. You can always change into pretty shoes when you are on location. Although some shots of what it takes to get to a spot can be fun to look back on later. On average, the Grand Canyon has 264 sunny days per year. So, chances are you will have a bright day – and if it’s during the summer, it will be hot. With shade being scarce, it’s important to prepare for a session that might make you sweat. Keep these tips in mind when preparing to head out to your sunny and hot photo session. 1. Bring plenty of water because hydration is essential. 2. Apply sunblock thirty-minutes before heading and out and bring some extra with you. 3. Bring towels to soak up the sweat. 4. A portable personal fan is a great tool for cooling off between shots. 5. And finally, don’t forget a makeup bag for touch-ups. As a photographer, there is a perfect time of day to take photos. It’s the hour right before the sun sets and is what we in the business lovingly call the golden hour. 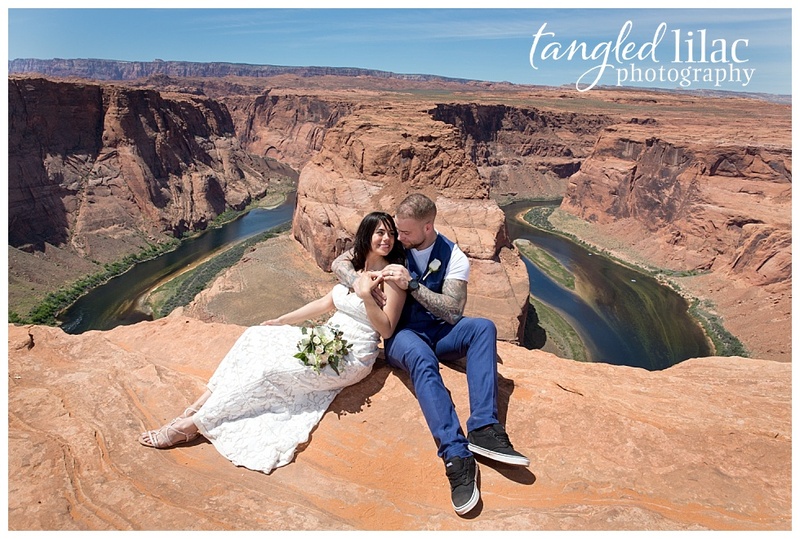 Despite the crowds, the heat, and the fact it was high-noon with no shade (a photographer’s nightmare), we were able to get some incredible images that I hope they’ll treasure forever. Kyle and Ivana’s tenderness towards one another was so sincere and so heartfelt, and I loved watching them interact. Congrats you two! I hope you enjoyed your desert honeymoon! Meet Linda and Larry. 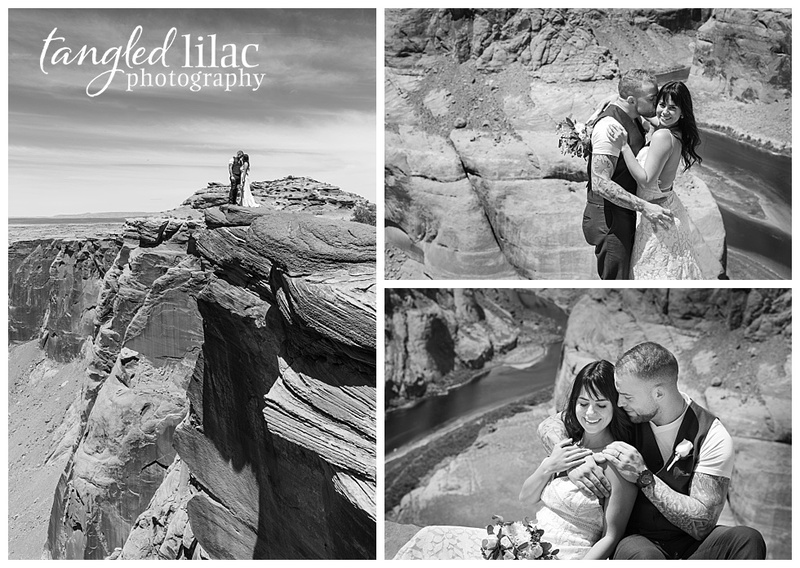 They chose the extraordinarily breathtaking Red Rock Crossing and Overlook for their wedding ceremony. Red Rock Crossing is one of the most photographed spots in Arizona. The warmth of the red rocks and the inviting sounds of the creek making its way through lush greenery provide a majestic spot for ceremonies of any size. It also happens to be easily accessible with plenty of parking and a short walk to the creek. 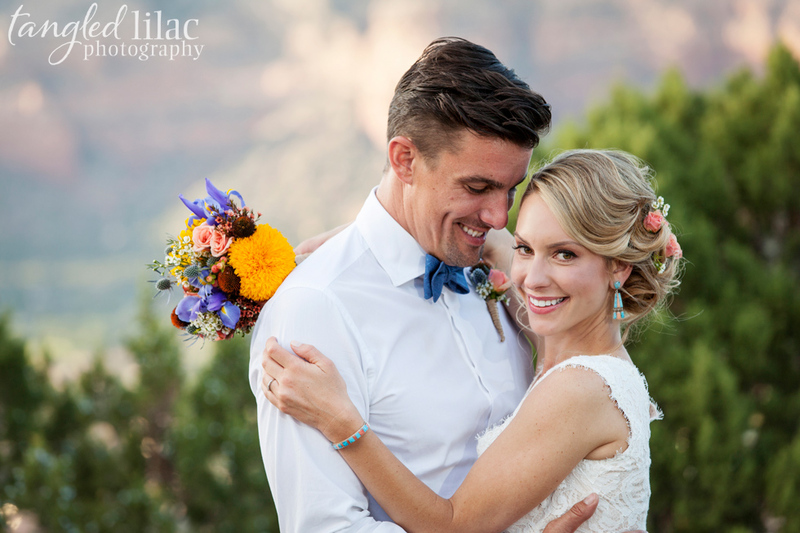 Just one look at the photos and you’ll know why this couple decided to elope to Sedona and settled on this special place for their intimate celebration of love. 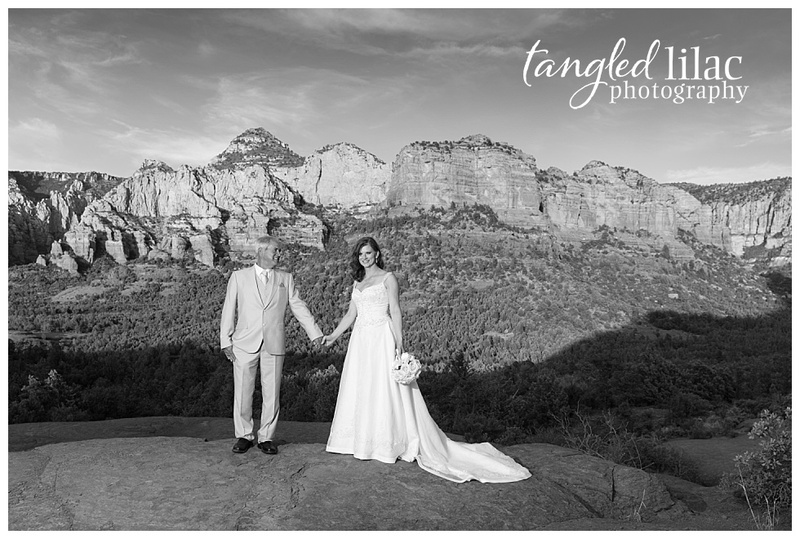 The spectacular image of Cathedral Rock in the background put an exclamation point on their special day and made for an array of stunning photos for Linda and Larry to share with their family and friends back home in Chicago. The park is just a couple miles west of the center of Sedona and a perfect location to bring both Oak Creek and the splendor of the Red Rocks into your images. Linda, a therapist, knew she wanted a professional photographer at their intimate ceremony. Larry, an aerospace engineer, wasn’t quite so sure. It didn’t take long for Linda and Larry to get lost in the warmth of the sun, the beauty of their surroundings and the emotion of the day. Before too long, they both relaxed and enjoyed being the star of the show. Just look at how they get lost in each other’s eyes. Something tells me, they forgot I was even there. 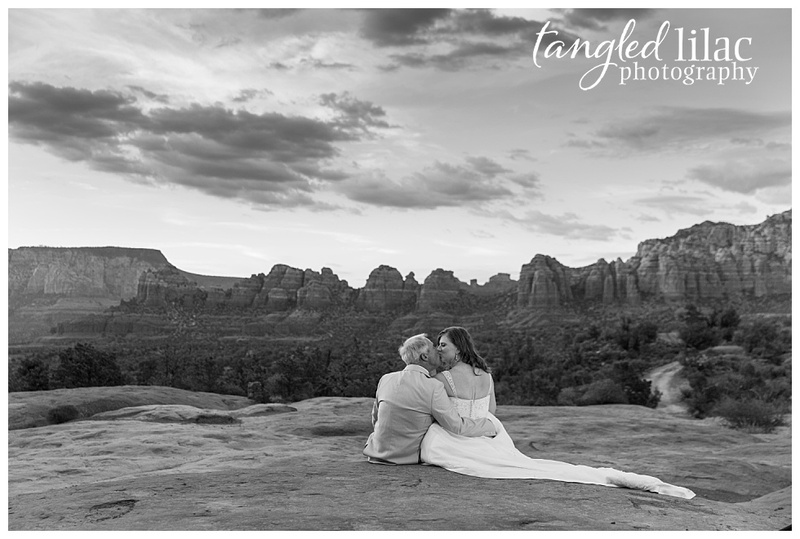 I get questioned all the time, why I still shoot in black and white – especially when there are so many brilliant colors found in the backdrop of Sedona. There is something pure and deliberate about black and white photography. Shooting in black and white allows you focus completely on the subject and it gives room for the joy of the day to shine through. Looking at Linda’s face, you can almost hear her whispering, “I do.” And Larry’s happiness is plain as day. It’s fair to say, he was comfortable with the camera by this point. 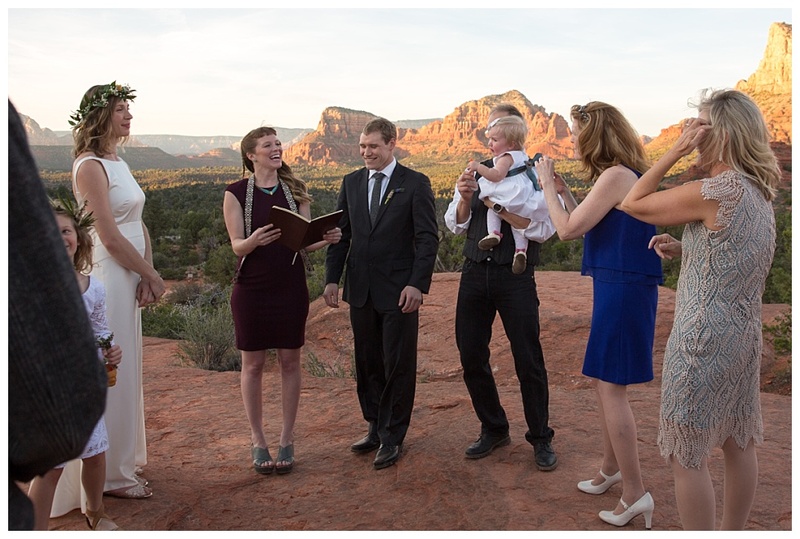 The perfect “first kiss” photo needs a little help from the officiant. It’s okay to ask him, or in this case, her, to step to the side for the photo op. That’s what happened here and I was able to capture a personal and private moment for their visual love story. Talk with your photographer and let them know the plan. 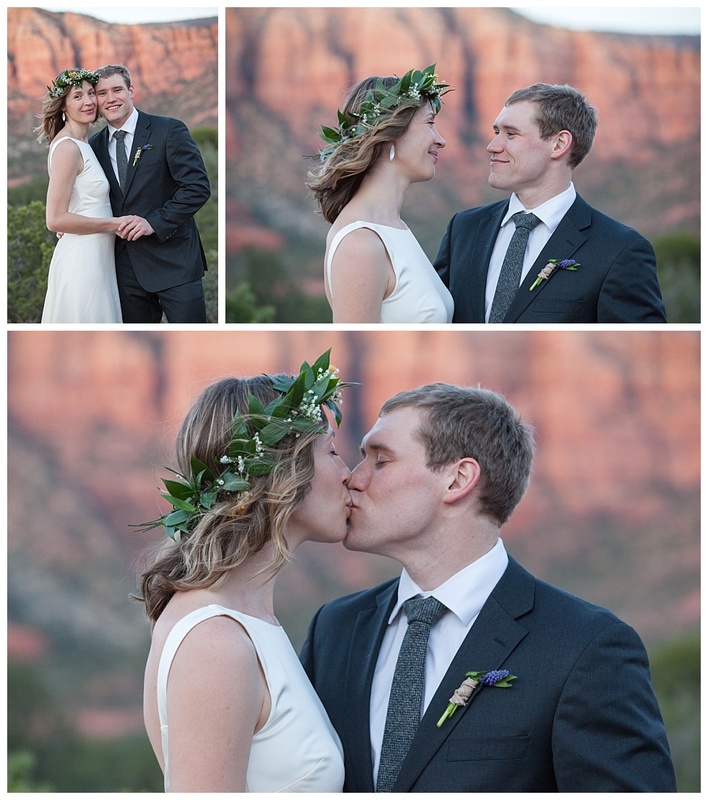 Kiss for longer than you think you should, giving your photographer ample time to capture the flawless shot. When in doubt, kiss again. And again. And again. It’s tough work, but someone has to do it. I adore the fact that Linda wore a proper wedding dress. 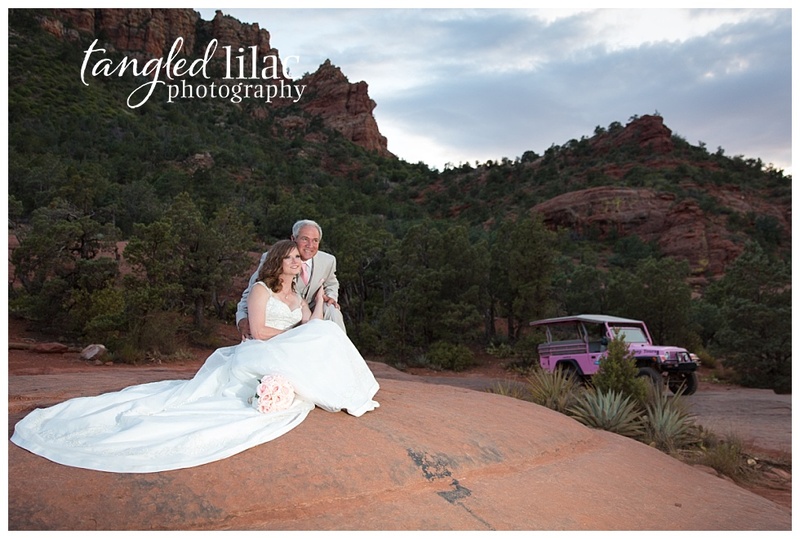 The simple silhouette with beautiful beaded accents and fabric that fluttered in the wind was the perfect choice to stand up to the brilliant backdrops that Sedona provides. 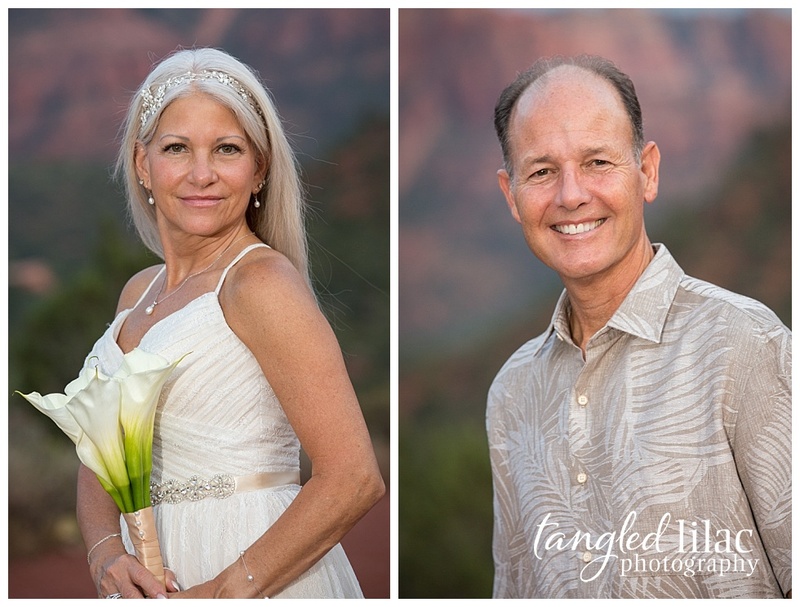 Larry dressed in neutral tones, not only allowed his bride to shine (as every good groom should do) but allowed the hues of the Red Rocks to do their job and create the perfect stage for their story. It was an honor to be a small part of Linda and Larry’s day and I’m grateful to have been able to witness and document their love story as they begin their new chapter as husband and wife. 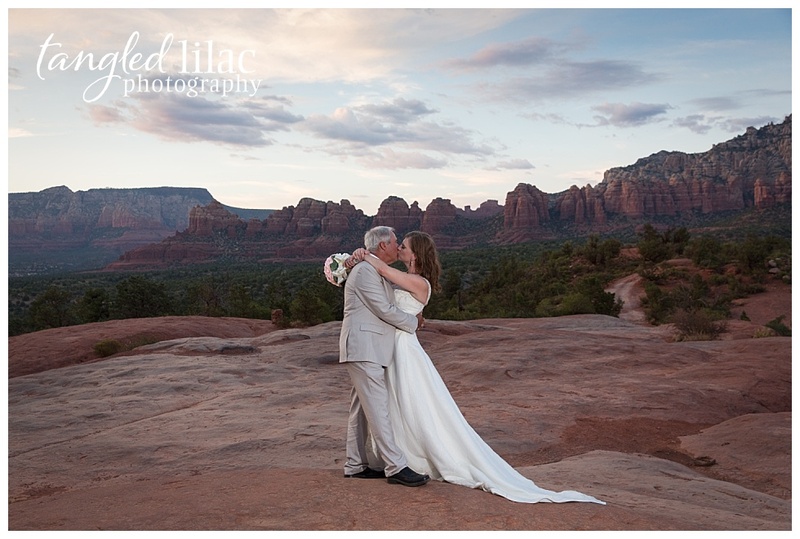 And as they head off into the fabulous sunset of Sedona, I wish them a lifetime of happiness and beautiful memories together. 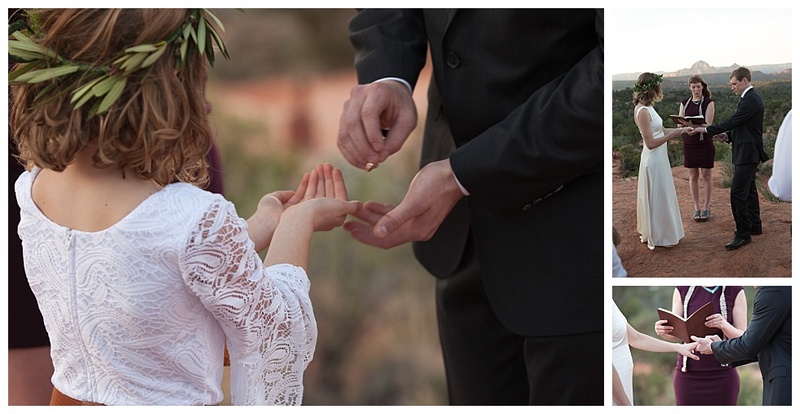 Couples eloping in Sedona can walk away with a visual wedding story that will wow their friends and family and provide a stunning reminder of their special day for years to come. Breathtaking images don’t just happen, though. To capture the beauty that surrounds you, make sure and do a little planning ahead of your arrival. Sure, eloping is meant to alleviate the frustrations and expense of planning a big wedding, but finding the right spot, bringing the perfect dress and friending the best photographer will take a bit of effort and research. It’s worth the effort and it will pay off big time. The reward will be the most spectacular photos that will last you a lifetime. 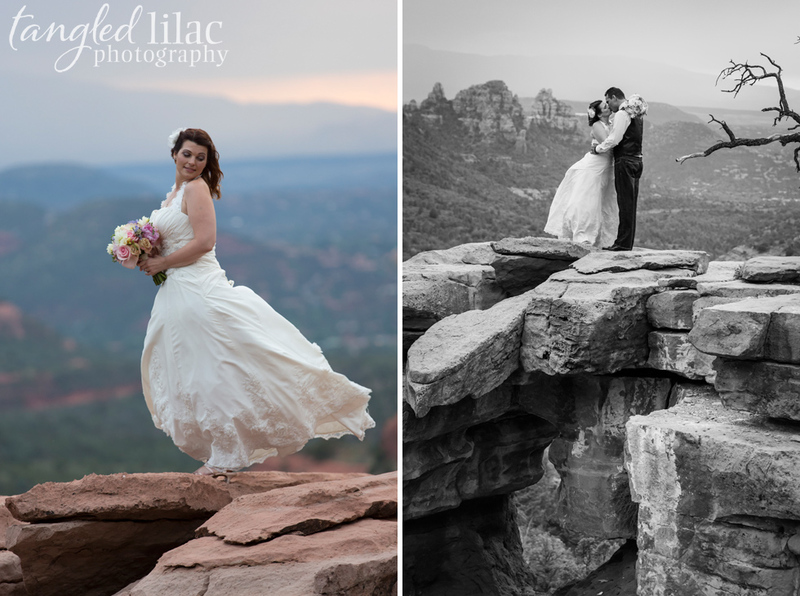 To help minimize some of your efforts, remember these five things when planning your Sedona elopement photos. 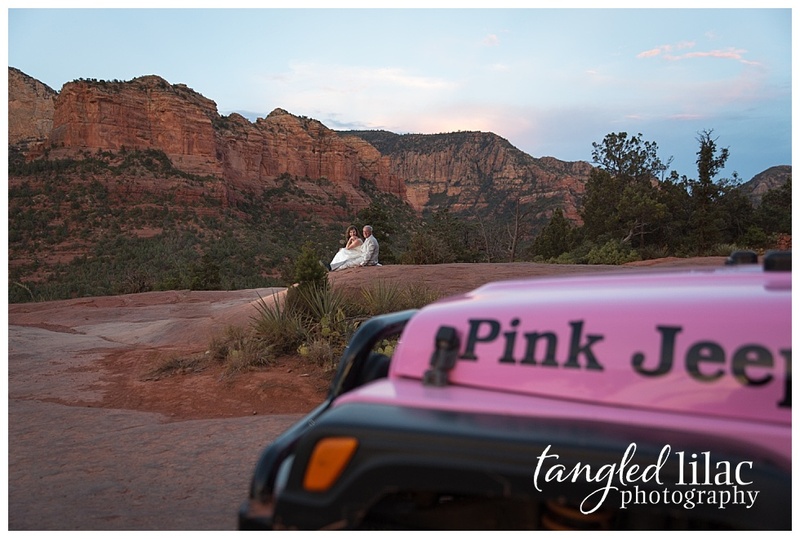 It’s true that it is hard to find a bad photo taken in Sedona, but you don’t want your wedding photos to have the same Sedona backdrop as everyone else’s. 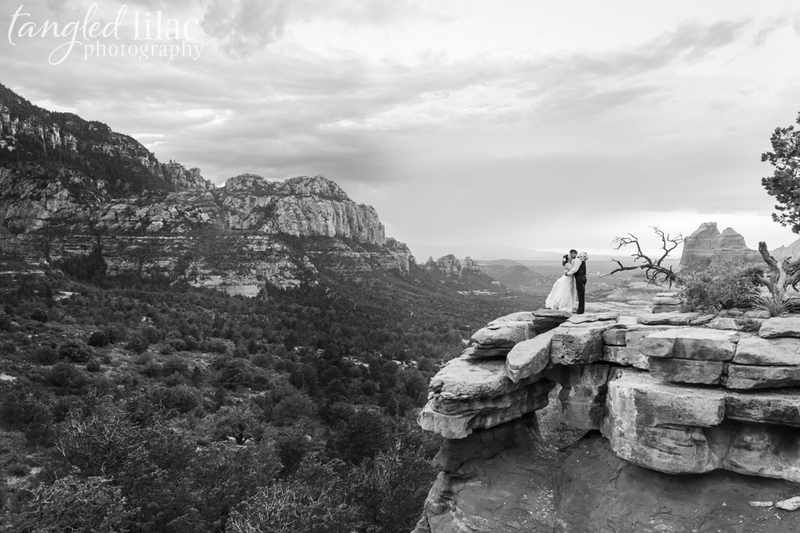 A photographer that specializes in elopement photography in Sedona will help you find the perfect spot that compliments your personality, enhances the emotion of the day and is unique to you. 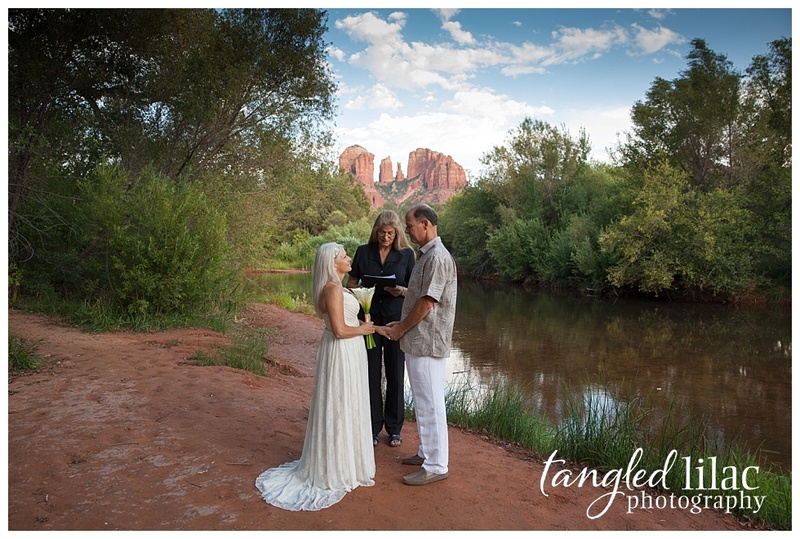 Most couples that elope to Sedona have their ceremony and take their photos in the same location. Not only does this save money which is often a motivator for eloping couples, but it also creates a better story of the emotion and love of the day, since you’re not running from one spot to another. That doesn’t mean it’s impossible to navigate multiple sites, you absolutely can. But the right photographer is even more critical when doing so. Notice a theme? You absolutely must include the Red Rocks in your photos. It is what Sedona is known for, after all. While most seasoned pros bring off camera lighting (I use it for every shot), nothing beats natural light for complimenting an image and creating the mood. 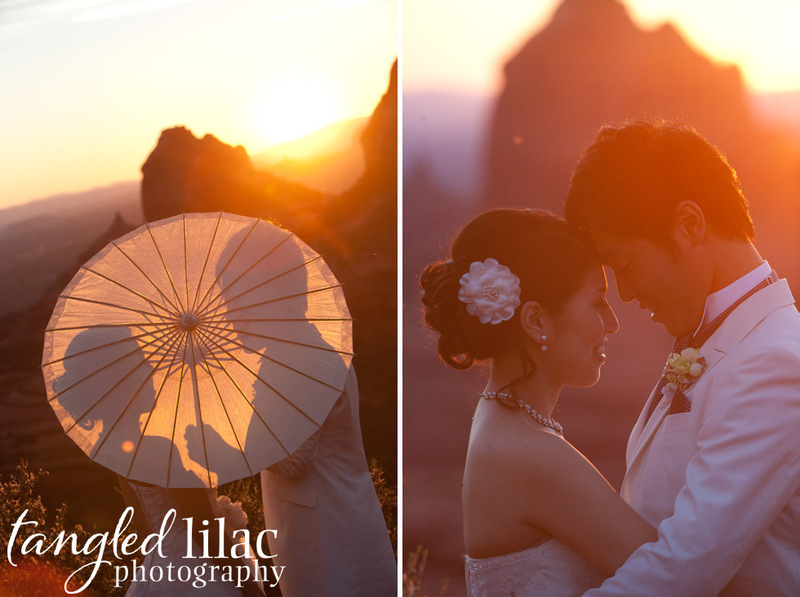 In photography, there is an ideal time of day to produce exquisite photos – it is called the golden hour. The golden hour is the hour after sunrise or before sunset that provides a softer hue than when the sun is higher in the sky. 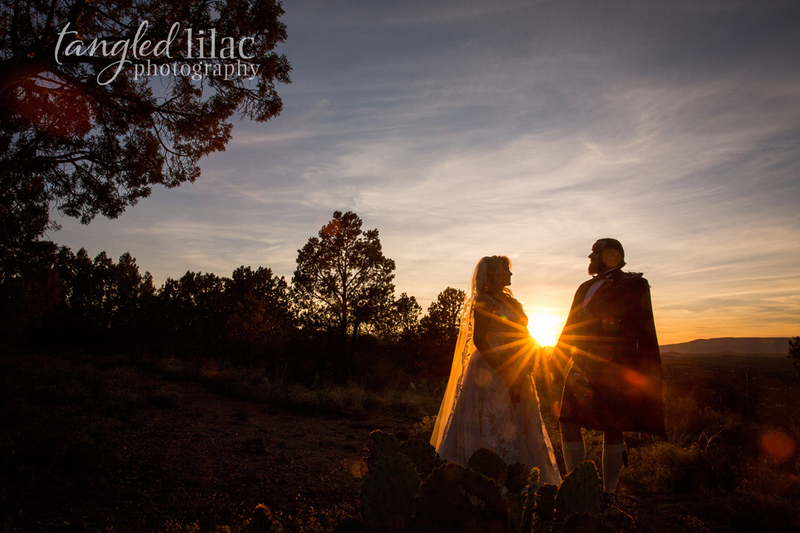 The time right before sunset is the ideal time of day for scheduling your elopement photos. 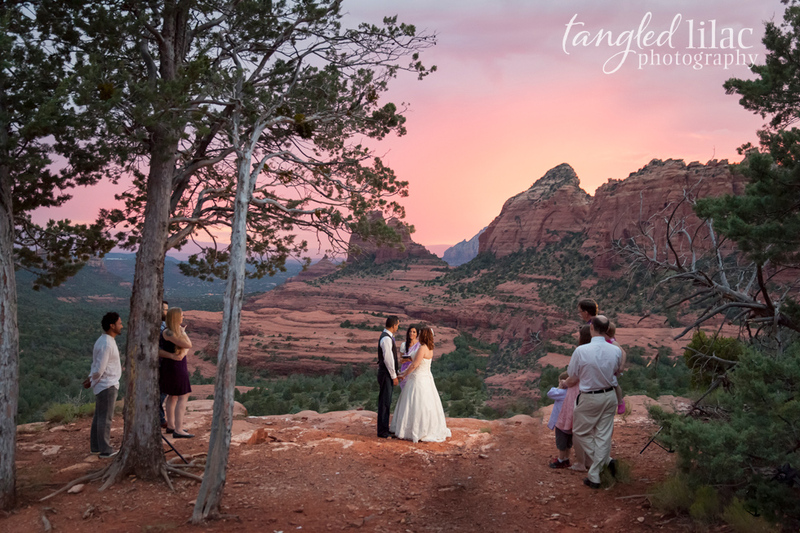 Not only will you look better in your photos, but it is the perfect time to capitalize on the magical sunsets that Sedona is known for. 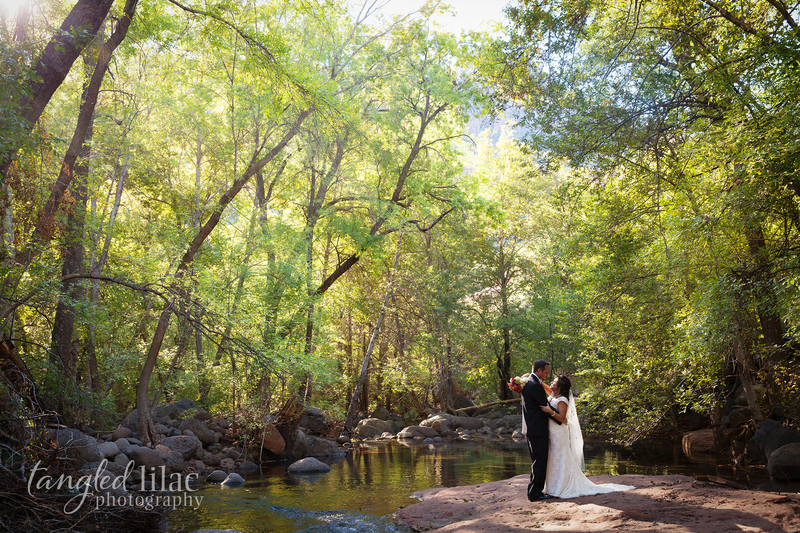 There is one exception in the area: Oak Creek Canyon. The best time of day to shoot your photos along the creek is about 2-3 hours before sunset. The sun is a little higher in the sky which provides for those captivating photos that have the sunlight filtering through the trees. There’s a reason why Sedona offers the best hiking and that’s because there is a lot of hiking. If you want those sweeping landscapes, and trust me you do, then come prepared to hike. You can always choose to change into your fancy shoes once you get there, but make sure your photographer captures a few images with your hiking boots. Those are always the fun images to look back on. The Red Rocks of Sedona can be a little dusty. Be prepared for your dress to get a little dirty, but hey that’s what dry cleaners are for. To be honest, those are the imperfections that make photos from Sedona so impressive. When making a decision about a which photographer to hire, ask yourself if you can see yourself being friends with her. 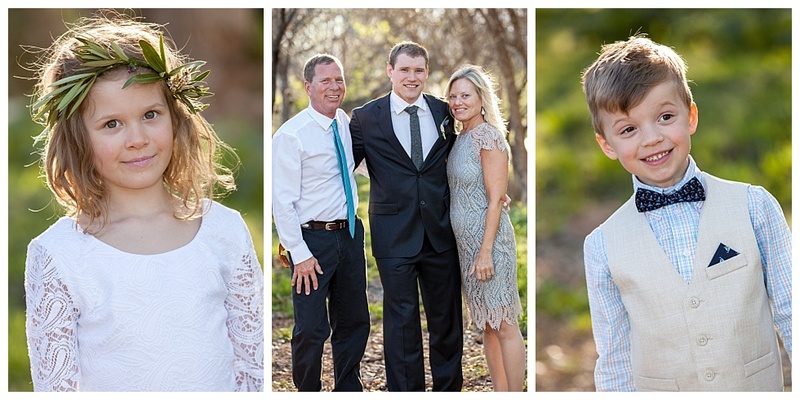 Having a connection with your photographer will help translate the natural emotion of the day to your keepsake images. 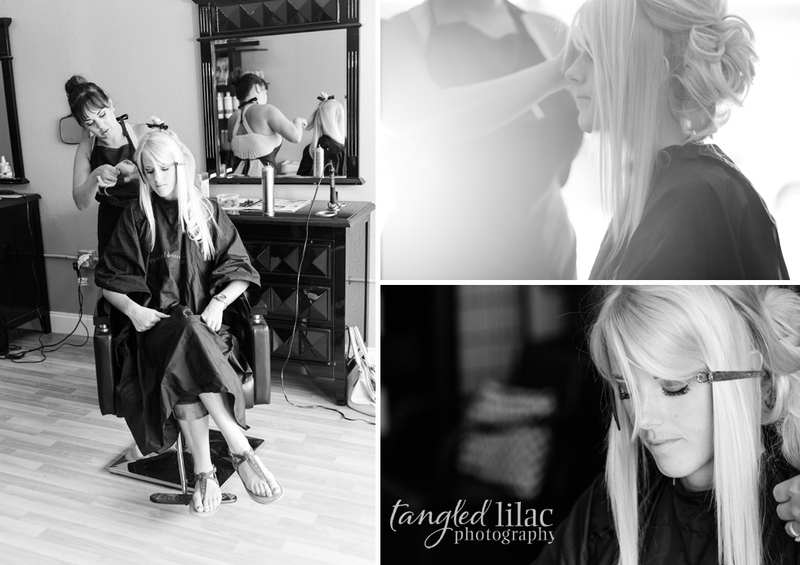 As you go through the process of selecting your photographer make a point of talking with her. Pick up the phone and dial. Better yet, arrange a Skype or Facetime call. No texting. No email. No Facebook. There is nothing that replaces verbal (and visual if available) communication in this situation. If you don’t like your photographer and don’t feel a connection with her, you won’t feel relaxed. And if you aren’t relaxed it will show in the photos. Take the extra time in planning here. 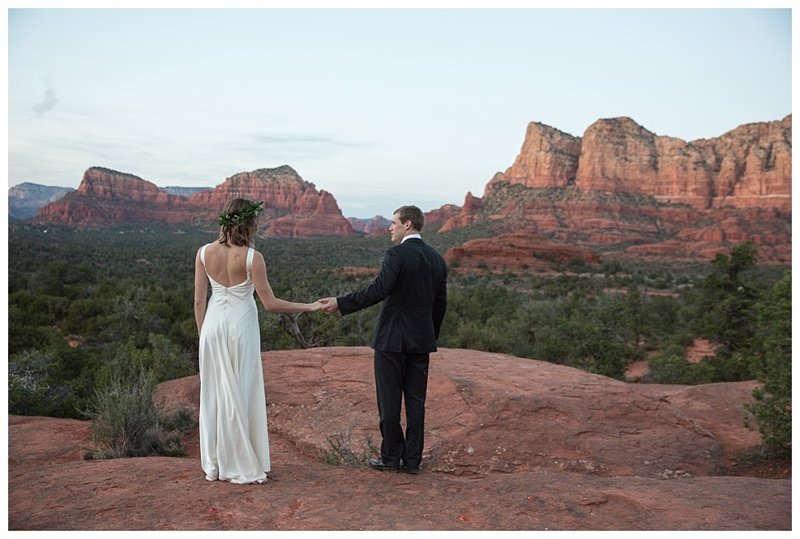 It may be the most important thing you can do to prepare for your elopement in Sedona. Thanks to Pinterest and the Internet, most brides have some ideas around the style of photoshoot they want. They may even go so far as to have specific poses they want to incorporate into their session. In fact, one of the best ways to communicate with your photographer (after you’ve talked to them on the phone, of course) is to create a Pinterest board. 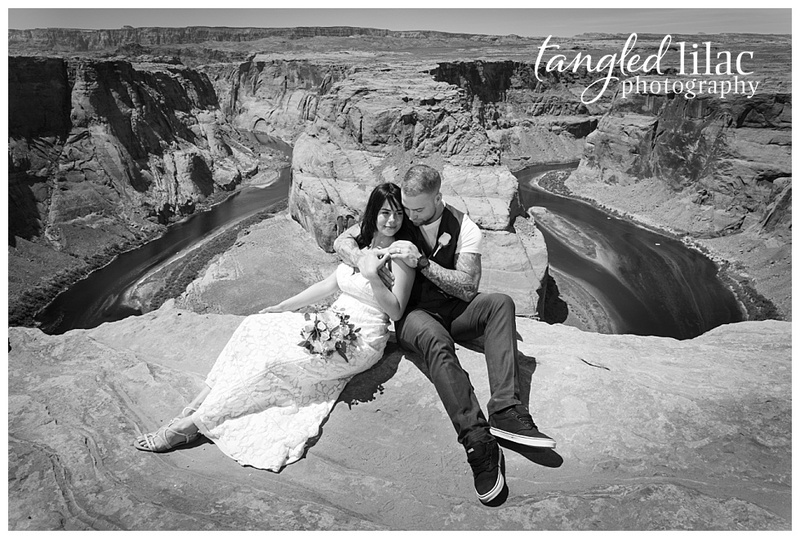 You and your photographer can share ideas back and forth and create a plan for your elopement photos that you will love. For instance, if all of your inspiration photos are sunsets and you’re getting married at 2:00 p.m., you are going to have a problem. The right photographer will help you work through that. It’s important to know that not all photographers are created equal. This goes back to becoming BFFs with your photographer. When you get to know and like your photographer, you will trust her when she makes recommendations. These discussions should happen before you arrive, so the expectations are set and your special day is captured just the way you envision. When shooting on location, the biggest potential wrench is the timeline. Double check your elopement day hair and makeup appointments, allow for time to travel to the location and make sure everything is pressed and ready to go. Allow for extra time for traffic and other people running late. In the end, the buffer of time you add into your schedule will help alleviate stress. And if you’re done early, you’ll have time to enjoy a cocktail. As you can see, a little planning can go a long way. 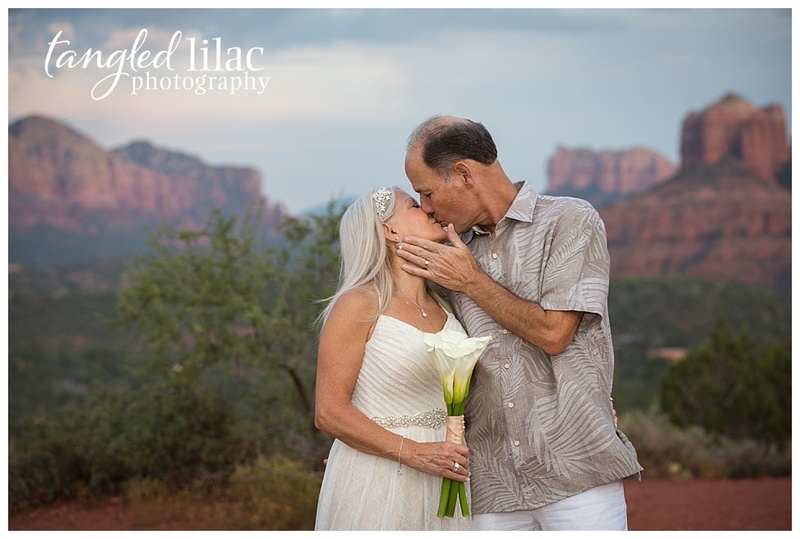 The best part about hiring and talking directly with a local Sedona photographer is the fact that they know their way around. The right photographer can provide you advice and recommendations that you might not think of because you are not familiar with the area. If you find the right photographer it will be easy to trust that you are in the right hands. 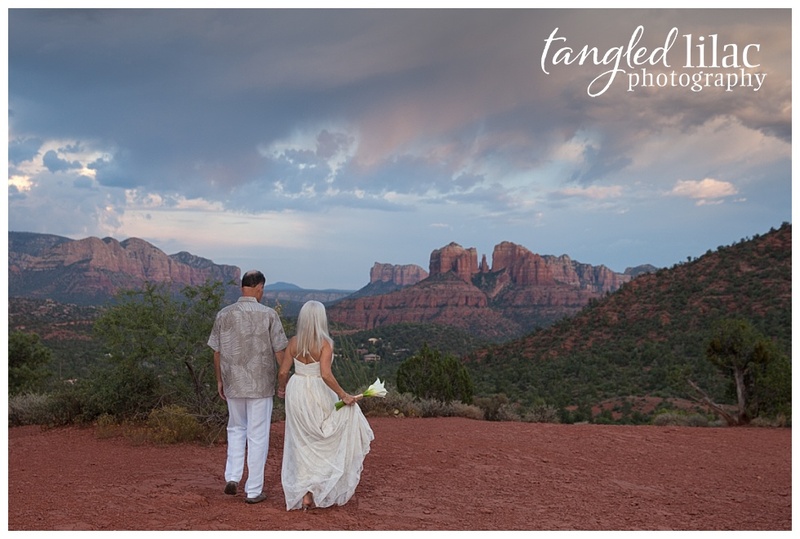 There are many reasons couples are eloping in Sedona in record numbers: The weather is perfect, the scenery is stunning and the atmosphere is magical. 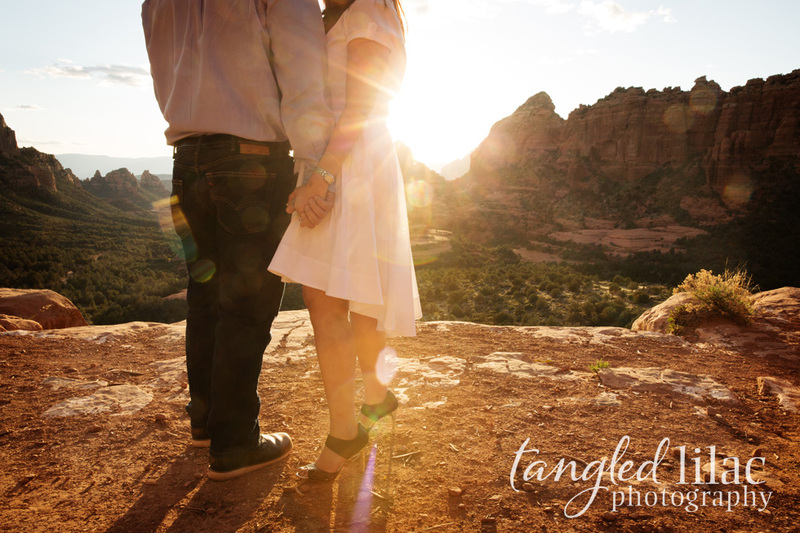 As a photographer, spending time with couples who are eloping in Sedona is one of my favorite things. Nothing gives me greater joy than helping a couple find the perfect spot with a stunning backdrop that captures their joy and love and showcases the couple and their personalities. Whether to elope or not is a personal decision and each couple makes the decision for different reasons. 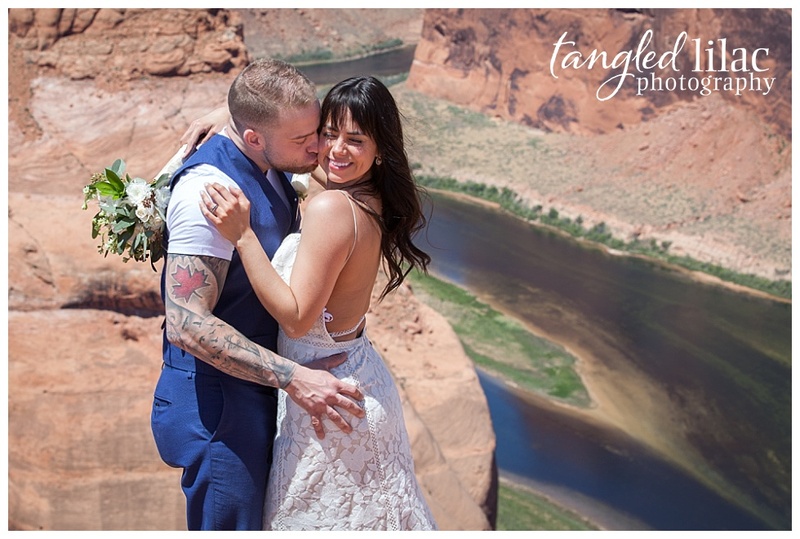 But if you are considering eloping in Sedona, ask yourself these five questions before making plans. 1. Should we hire a local wedding planner, photographer, and videographer? Wedding planners can be helpful in many ways but aren’t always necessary depending on your vision for your big day. 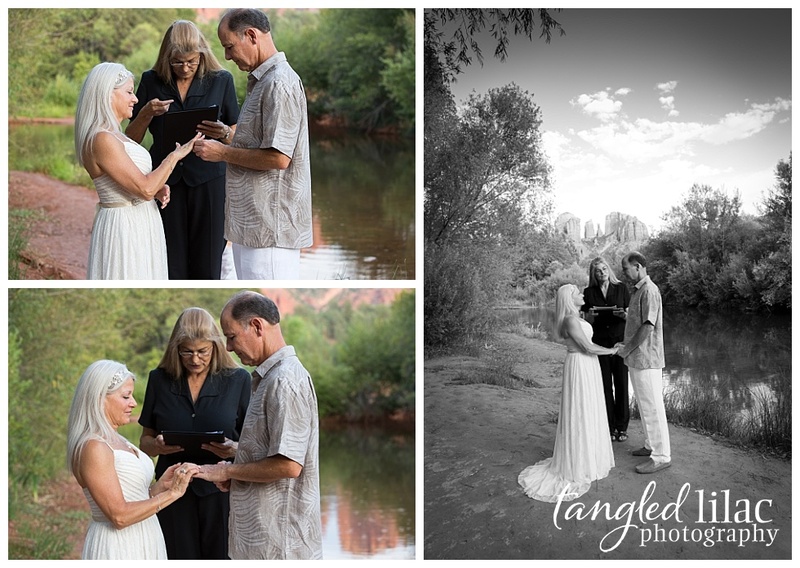 Sedona is unique because there are many different themes that can be intertwined with your ceremony and photos. From minimalistic to extravagant, from elegant to casual, from country to chic, a wedding planner can help pull all the details together to give you the day of your dreams with local touches that will make your wedding unique to you. On the other hand, though, plenty of couples arrive in Sedona and are able to pull their day together after doing some basic research online. It really depends on you and your comfort level and the amount of free time you have available. Now, your photography is another story. As a photographer, of course, I’m going to say there is no substitute for a professional photographer. And there isn’t. 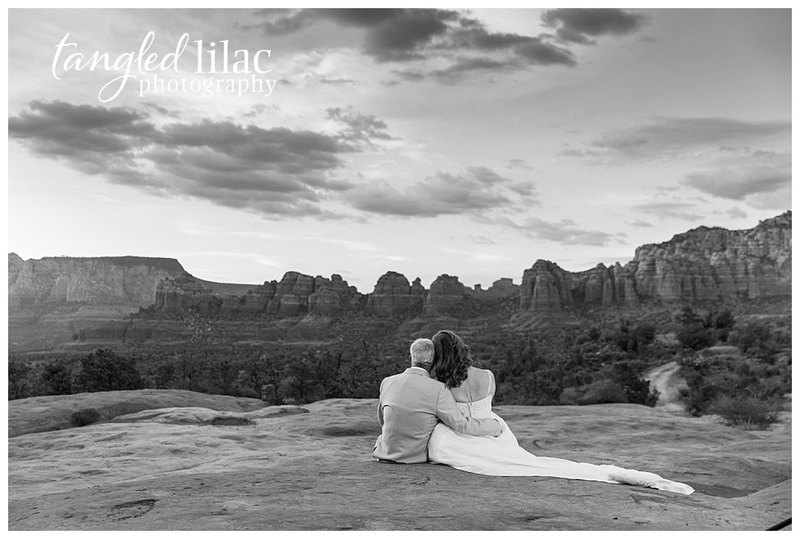 One of the things I hear most often from couples eloping in Sedona is how the photos of Sedona don’t do the area justice. And it’s true. Sedona and its sweeping landscapes require a professional’s touch. Your wedding photos will be something you treasure forever. Pairing up with a photographer who knows the area and who you trust and connect with will translate to the images you receive. 2. Do we invite others or keep it personal? Answering this question goes to your motivation for eloping in Sedona in the first place. Do you want to escape family drama, avoid the big ceremony or just eliminate the stress of planning a wedding? If you choose to invite others, it’s easy to have a weekend full of fun activities that include hikes, jeep tours, and exploring. If you choose to keep it simple, you may want to consider inviting your two closest friends to act as witnesses, but even that isn’t necessary. Of course, I always recommend a couple surround themselves with those they love the most, including their furry friends. It will make the cherished photographs from the special day much more meaningful. 3. Do we send announcements and when do we send them? 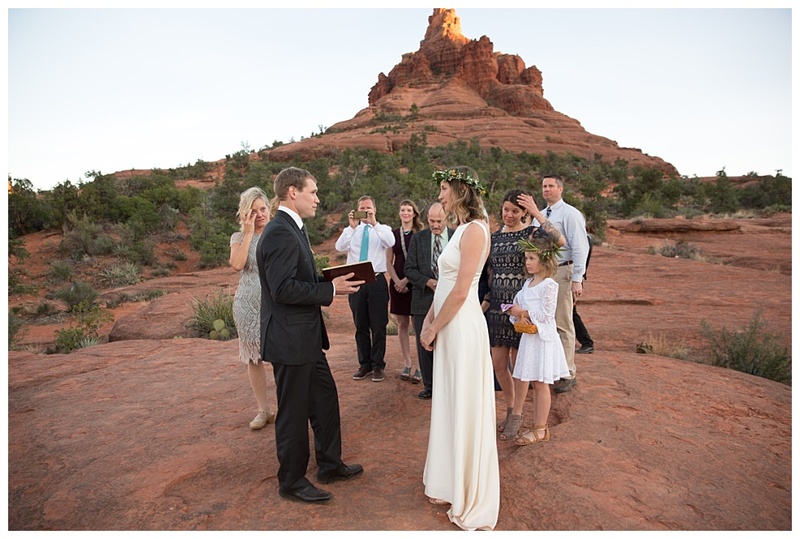 It is common after eloping in Sedona for the couple to return to home and have a reception for loved ones and cherished friends. A wonderful touch to the announcement of your wedding and/or invitation to the reception is the use of one or more of photos from your actual day. Unique ways to share the story of your special day is something to consider. A cinematic slideshow that captures the emotion and beauty of the day is perfect for your the reception back at home. It makes everyone feel they were part of your special day. 4. Where do we get married: The courthouse, hotel or on a location? 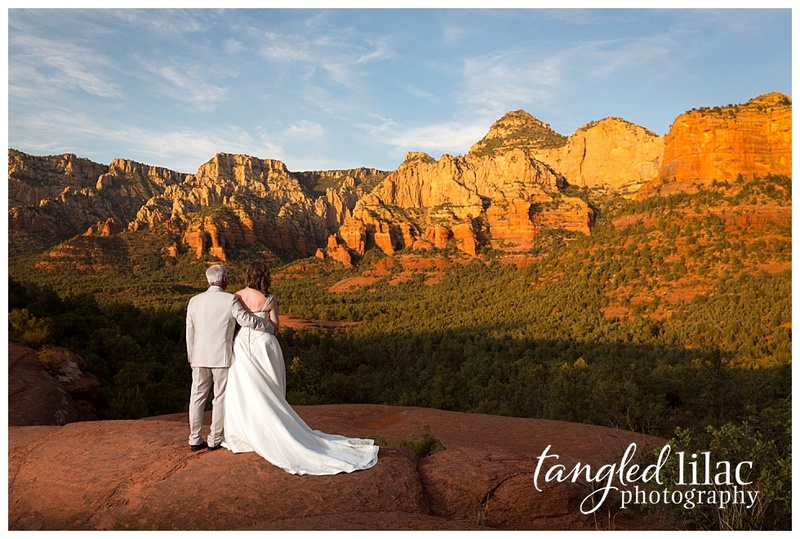 Again, this is a personal choice, but if you are making a point to elope in Sedona, it makes sense to capitalize on your beautiful surroundings. 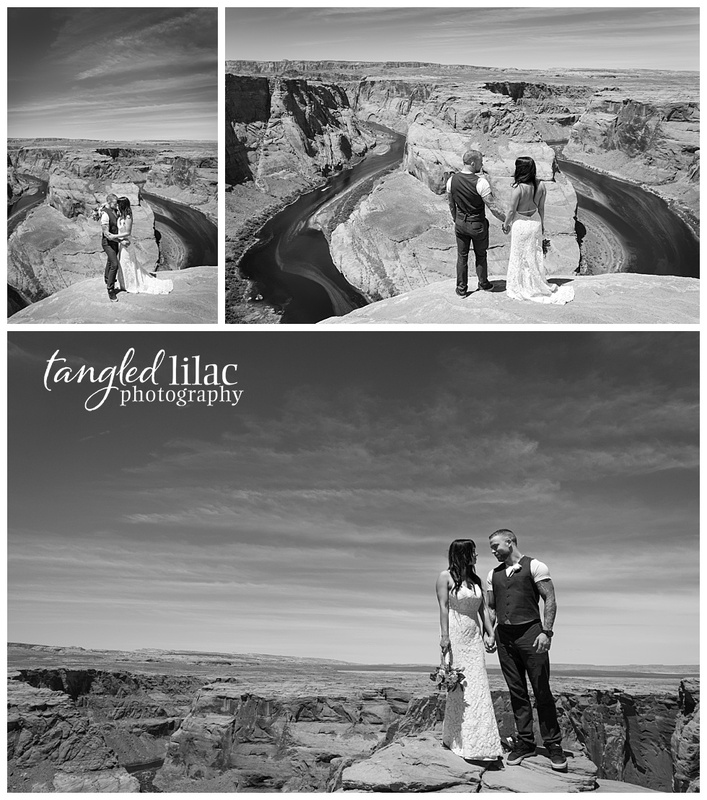 It makes the most sense to utilize the diverse area with their red rocks and unique landscapes that will make for one-of-a-kind images that will be cherished for a lifetime. If a church wedding is part of the plan, there are a few options for you to consider. Local clergy will conduct ceremonies outside. If you have your heart set on a church service, there is a stunning chapel, Tlaquepaque, that embodies the spirit and feel of the southwest. Regardless of what you choose for the location of your ceremony, you will want to make sure to schedule a stop at one of the many local scenic spots for your photographs. 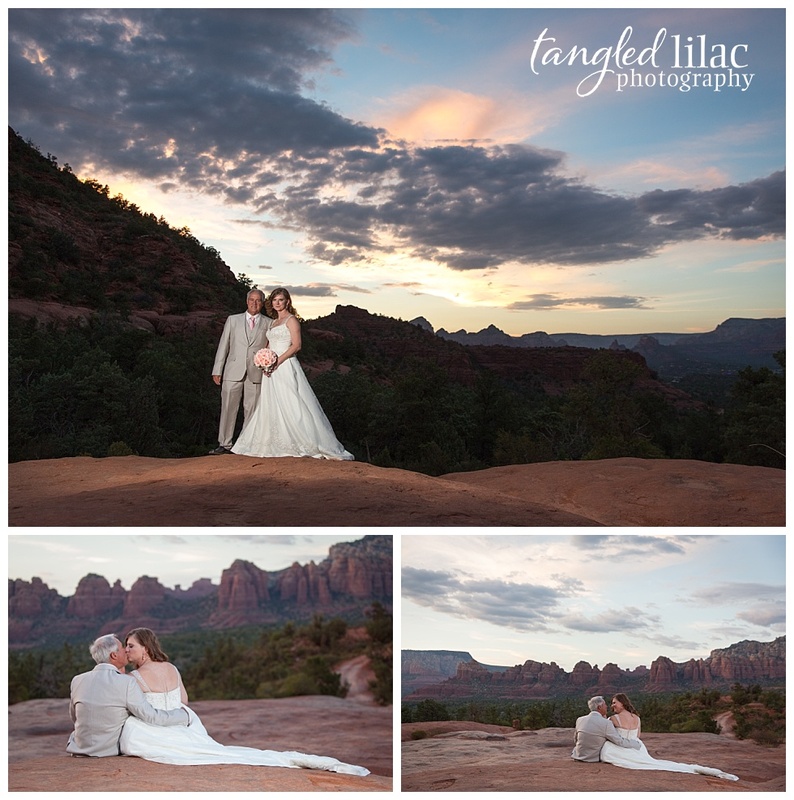 You can’t elope in Sedona and not have the beauty of the area captured in your memories. 5. What do we wear? 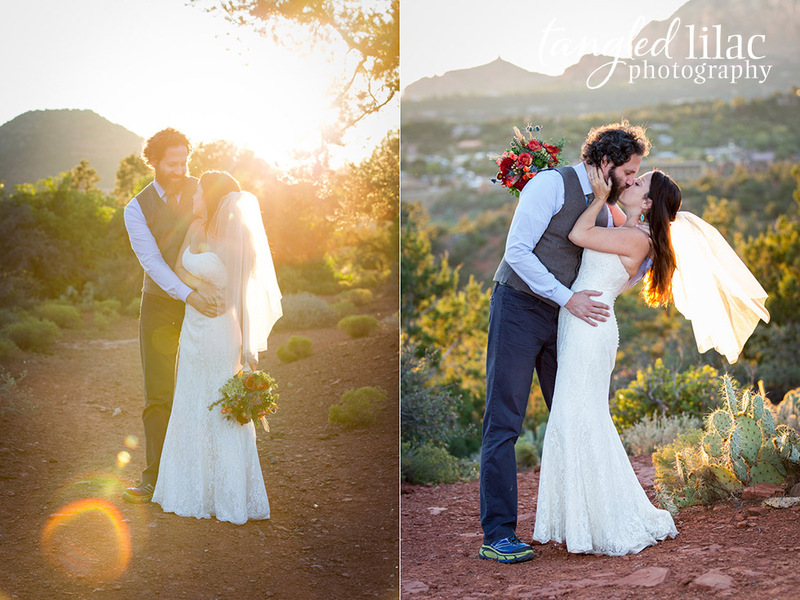 Let me begin by saying the backdrop of Sedona goes with any outfit. But let’s be real, it has to be about the dress. Gowns that move in the breeze, fabulous ball gowns and a little drama goes best with the dramatic red rocks and breathtaking sunsets. You’ve decided to forgo the big wedding, so why not splurge on the dress and the images? Bring a spare dress for a dip in Oak Creek. The photos are stunning and worth the effort. 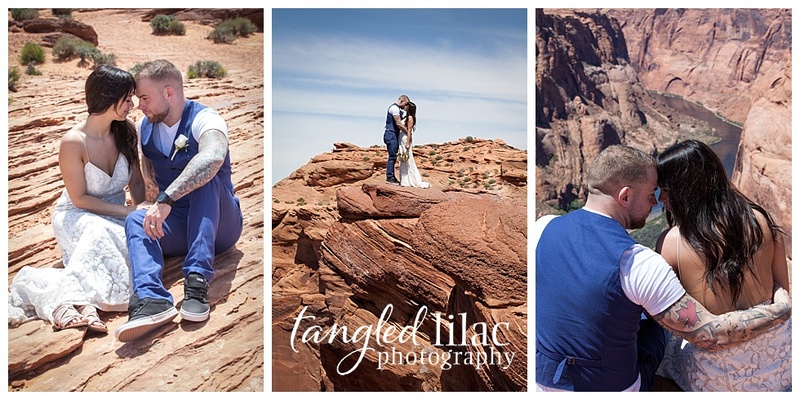 With a little preparation and the right photographer, eloping in Sedona can be spectacular and provide you with a visual love story that will last a lifetime.